Hurricanes devastate more than just shorelines and the communities along them; they also destroy marine habitats in the ocean and the marine creatures that live in them. Dolphins, though, do not appear to be as affected by hurricanes as other, smaller marine animals can be. Dolphins in nature seem to have the ability to sense when a hurricane is brewing. Scientists believe they may react to the decrease in salinity that occurs in the ocean after large amounts of rain. Since a hurricane's rain bands typically occur several days in advance of the actual hurricane, dolphins have time to take precautions and seek refuge deep in the ocean. Other ocean animals, typically smaller ones whose habitats are confined to localized areas, can't swim away to safety or dive deep into the ocean's depths. Dolphins' size and keen sense of changes in the ocean help them escape unharmed in advance of hurricanes. 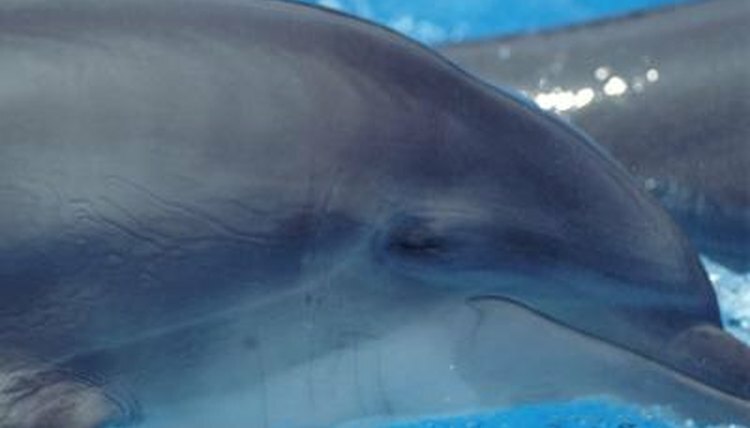 While most marine species decline from the ravages of a hurricane, the number of dolphin calves tends to stay steady or increase slightly. Scientists know that when a mother dolphin loses a calf, she's able to bear another calf sooner than if the first calf had lived. Instead of giving birth every three to five years, as is normal for dolphins, a mother of a calf who dies can have another calf in about 12 months. So even though calves often don't survive a hurricane, their numbers are restored with the birth of new calves. Scientists from the University of Southern Mississippi, conducting dolphin research for several years after Hurricane Katrina struck the Gulf coast in 2005, found that the number of dolphin calves increased significantly. Further research revealed that 75 percent of the food dolphins eat are the same fish commonly caught through commercial fishing. Since Katrina destroyed most of the commercial and recreational boats in the area, many more of those fish were left in the sea for the dolphins to eat. More dolphins survived, and pregnant dolphins -- with more access to food -- bore healthier babies. The milk they produced was also more nutritious, giving the calves better chances for survival. One of the devastating effects of hurricanes is the displacement of species -- pushing them out of their natural habitats to areas where their survival is difficult. Displacement of dolphins is rare, probably because they are adept at sensing impending hurricanes and swimming to safety. After Hurricane Rita in 2005, however, huge storm surges pushed the water and seven dolphins into inland areas of Louisiana. They were found in roadside ditches, canals and pits, carried there by the high water. Even though the water quality was very poor, with decaying matter, hazardous materials, oil sheens and few food sources, six of the dolphins survived up to five months until they could be rescued and released back into the Gulf. National Science Teachers Association: What Happens to Animals During Hurricanes? Scientific American: What Do Hurricanes Mean for Dolphins? How Many Polar Bears Are Still Alive? What Is the Purpose of the Dolphin's Blubber? What Is Unusual About the Lake Nicaragua Shark? Why Do Bottlenose Dolphins Live in Shallow Waters? What Is the Killer Whale's Habitat? What Causes Starfish to Be Washed Ashore? What Are Interesting Adaptations of the Hector's Dolphin? What Is the Texture of a Dolphin's Skin?